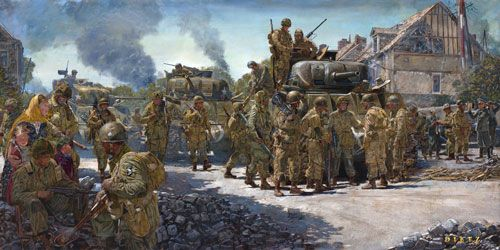 James Dietz Handsigned and Numbered Limited Edition Print:"Day of Days"
Size: Image Size: 14" x 28" / Overall Size: 19" x 31"
About the Art: June 6, 1944 - Le Grand Chemin. Fresh from their baptism of fire, the "Screaming Eagles" of Easy, Dog, and Fox companies, 506th PIR, regroup and rearm, having silenced the guns of Brécourt Manor. Now, their reinforcements arrive. From Utah Beach, come the M4 Sherman tanks of the 70th Tank Battalion. From scattered drop zones across Normandy, come other paratroopers of the 82nd and 101st. Together, they'll return to Brécourt to clear the last resistance, and this time, the tankers will take the lead. They made it off the beach, safe from Brécourt's guns, and are eager to repay the favor. It's just the start of a long, costly crusade, but today, on the day of days, it begins with victory.